Managing Startup apps and programs on a PC is useful, but what do you do if you suspect that a startup service, codec, driver, task, or Registry item is causing a problem or a slow-down, or if malware might have infected the PC. This is where Autoruns comes into its own. 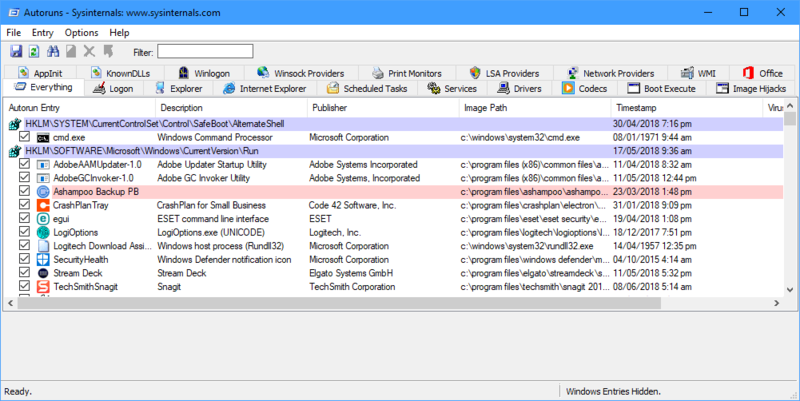 Autoruns is part of Microsoft’s Sysinternals suite of troubleshooting and repair tools. It displays every startup item on a PC, each one organised into tabbed groups to make them easy to recognise and find. Malware for example, might set a Logon entry to start its processes, or a badly-written video or audio codec might need identifying and removing. Each entry listed in Autoruns contains useful information such as the item’s publisher, file name and path. You can sort entries in useful ways too, such as by when they were added (to troubleshoot a problem that’s started recently) and you can search for specific entries via a single command. Autoruns is a highly useful tool that its worth spending time with, indeed the entire Sysinternals suite is an essential download for any system administrator or IT pro. You can download Sysinternals from the Microsoft website.